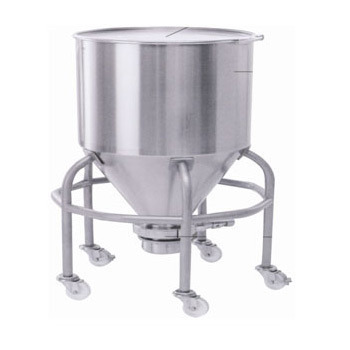 Owing to our rich industry experience in this domain, we are offering Round IBC Bin. Offered range is highly appreciated by our clients for its salient features like low maintenance, excellent performance and simple design. Keeping in mind the actual needs of our clients, we provide this range in customized options. Besides, clients can avail this entire array at affordable prices. Established in the year 2003, our company, Prism Pharma Industry is widely known today as a professionally managed ISO 9000-2008 certified organization providing CE Standard products. We manufacture, export and supply world-class Pharmaceutical Machinery. Our products include Laboratory & Pilot Scale Equipment, Wet Granulation Process and Dry Compaction Roll Compactors. The offered products are made from high class raw materials procured from trusted vendors and are widely known for their strength and long functional life. Propelled by extra ordinary talent and commitment to fulfill the exact customer requirements, we have carved a niche for ourselves in the industry. Our company is manned by a team of dexterous professionals, who possess in-depth knowledge and the required skills for carrying out their tasks efficiently. Our team of professionals and advanced machinery ensures that only best quality products are produced. That is why customers across industries appreciate our products because of their safety features, reliability and accuracy. We are committed to provide best in class products at economical prices.